What is the Purpose of an Air Filter? Although we can’t necessarily see it, there is a lot of dirt and debris that circulates throughout our homes. This debris ultimately ends up in your furnace’s ductwork system. If it enters the furnace itself, it can cause some significant damage. The sole purpose of the air filter is to prevent dirt from entering the furnace. When air blows through the filter, the dirt is trapped. We need to regularly change our air filter because they are unable to rid themselves of the particles that they have collected. If they become too clogged, air flow into the furnace is restricted, thus causing problems. 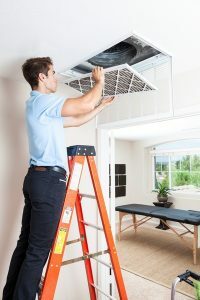 When your filter is clogged, your furnace struggles to circulate air throughout your home since there is significantly more airflow resistance than is normal. This decreases efficiency. In addition, a dirty filter might cause your system to short cycle. This is when your system turns on and off over and over again throughout the course of the day. When airflow is restricted, heat becomes trapped inside the furnace. This causes the internal temperature to rise, which activates the limit switch, so your system turns off as a safety measure. It takes a lot of energy to begin the heating cycle, so you can imagine just how much energy is wasted when it is repeatedly restarting. You can expect your system will be subjected to more wear and tear when it must work harder to do its job. This eventually leads to operational problems and eventually a system breakdown. We know better than anyone that repair bills tend to cost more than the average maintenance bill. Getting your air filter replaced is much easier than dealing with a system breakdown. If you do find yourself in need of repair, GRmetro Heating & Cooling offers service repair in Grandville, MI. The main role of an air filter is to protect the furnace. However, we do reap some of the health benefits. When the filter is too clogged, dirty air is forced around the furnace and released inside if your home. There is good news though: all of this can be avoided with regular maintenance and air filter replacement. Replace your air filter every 1-3 months to preserve the overall function of your system! Contact GRmetro Heating & Cooling today!